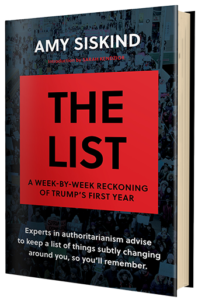 Compiled in one volume for the first time, The List is a first draft history and a comprehensive accounting of Donald Trump’s first year. All levels of donors will be recognized on the List website. If you'd like to list your name differently, please fill in "Other" field with your name preference. editing, and stock image licensing.